﻿ Chicago Hispanic Newspaper, Lawndale News, Hispanic Bilingual Newspapers, Su Noticiero Bilingue » An Act of War ! April 19, 2019 9:18 pm You are here:Home Commentary An Act of War ! Posted by on October 24, 2013 in Commentary | Comments Off on An Act of War ! While the eyes of most of America was on the federal government shutdown, a no less significant event was taking place in South America. 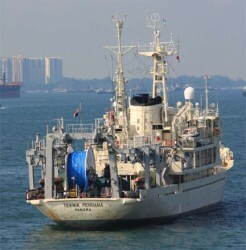 The Venezuelan navy had seized a U.S.-operated survey vessel, the Teknik Perdana, on October 12th, and took the ship back to Venezuela’s Margarita Island. According to the Venezuelan government, the ship was conducting “illegal activities.” What were these so-called “illegal” activities? It was conducting surveys for oil in waters clearly owned by Guyana (in fact, most of the crew are international. Only five were American). The Venezuelan government does not recognize Guyana’s claims to its own territorial waters, and so the Venezuelan navy forcibly took the Teknik Perdana. Five days after the ship was seized, it was released by the Venezuelan government without saying why it was being released. Fortunately the crew were not badly treated. However, this act was one of piracy by the Venezuelan government against one of its own neighbors. There is no question that the Venezuelan government had spat upon the sovereignty of Guyana, and that it had dragged the United States into this fray by seizing an American operated vessel owned by the Texas-based oil company Anadarko Petroleum US. Clearly, the Venezuelan navy had conducted itself in an unprofessional manner by seizing a vessel that had nothing to do with the Guyana government (certainly not its navy), and dragging this vessel out of Guyana’s waters into Venezuelan territorial waters. It would be like Cuba seizing an American operated vessel in U.S. waters and dragging it back to Cuba. Such a thing is an act of war . What Venezuela did amounted to the same thing—especially when you think about the fact that the Venezuelan navy could have established the identity of the vessel as a non-military ship in a matter of minutes and simply left it alone. Even though the Venezuelan government may “dispute” the waters where the ship was found as their own, the ship was non-hostile in nature and was NOT a Guyanese vessel. Why is Venezuela carrying out acts against its neighbors Guyana and Colombia? Because the socialist government of Venezuelan President Nicolas Maduro is looking for ways to take Venezuelans’ minds off of the basic shortages of foodstuffs and consumer goods that the country is suffering from now. But make no mistake about what is happening—this type of activity is an act of war against Venezuela’s neighbors and against the United States indirectly. How far is Maduro willing to push the envelope?